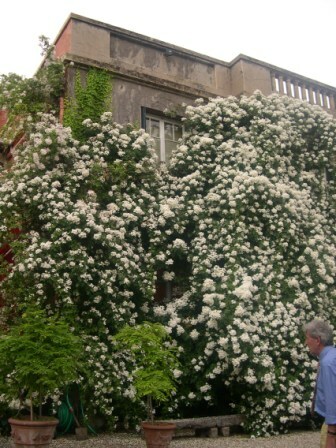 Rambling roses covering a wall in a garden in France. The hot days of summer bring unique pressures to your roses. In many instances they will actually shut down during the really hot days and go semi-dormant. This is a normal reaction and defense against the heat. We recommend letting your roses rest a bit during summer in order to get ready for the fall bloom. This means cutting back on feeding, spraying and surprisingly, perhaps even watering. That’s right, watering! When roses are heavily manufacturing blooms in spring and fall they take up a lot of water. In summer when they go semi-dormant they might need less. Here’s a great little watering test. Flood your roses with lots of water and mark the day on your calendar. Then cut off all watering and watch your roses. When the leaves start to droop you’ve waited one day too long to water. Count back to the day you watered and you’ll have your watering schedule! So let your roses rest a bit during summer and you’ll be well rewarded come fall! Cut back on the feeding and only use short term fertilizers so you don’t push new growth well into fall. You can use a spray of lime/sulfur spray to clean up any diseases that may occur during summer. Check your mulch layer. Make sure it hasn’t gotten too thin and add more if it has. Use a good hardwood mulch. Watch the watering as it’s easy to over water. Use our little test to make sure you aren’t over doing it. Don’t be alarmed by leaf drop. It’s normal during summer and just another line of defense against the heat.